A reminiscent trip back to Woodstock with music and commentary by Duke Gomez-Schempp. Woodstock—was a music festival attracting an audience of over 400,000 people, scheduled over three days on a dairy farm in New York from August 15 to 17, 1969, but ultimately ran four days long, ending August 18, 1969. 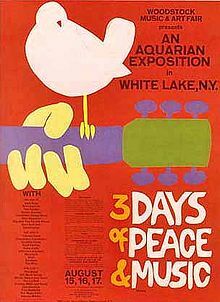 Billed as “An Aquarian Exposition: 3 Days of Peace & Music”, it was held at Max Yasgur‘s 600-acre (240 ha; 0.94 sq mi) dairy farm in the Catskills near the hamlet of White Lake in the town of Bethel. Bethel, in Sullivan County, is 43 miles (69 km) southwest of the town of Woodstock, New York, in adjoining Ulster County. During the sometimes rainy weekend, 32 acts performed outdoors before an audience of more than 400,000 people. It is widely regarded as a pivotal moment in popular music history, as well as the definitive nexus for the larger counterculture generation. Rolling Stone listed it as one of the 50 Moments That Changed the History of Rock and Roll. KPPP-LP FM is a project of The People’s Press Project. All Donations are Tax-Deductible. The People’s Press Project, a Moorhead based Media Justice nonprofit that was granted its tax-exempt status by the IRS on May 5, 2012. The PPP supports the development and advancement of KPPP-LP FM. We are asking for on-line donations to support the further development of community based and Independent media in the Red River Valley. To support this work, we ask that you consider making a tax deductible donation online: Click Here to make a Donation!